Increased log control and stability reduces problematic surging. Fiber pull and knot tear significantly reduced due to optimal cant control and knife stability. Knives are adjustable for precise settings. Knife ridge consistently formulates a uniform chip and provides a smooth transition to the counterknife. Open and unobstructed chip channel significantly improves chip flow, ensuring the highest level of chip quality is achieved. Quick and easy knife changes. Long lasting Ridge XL knife can be resharpened. Modular design allows for quick and easy change out of worn or damaged parts. 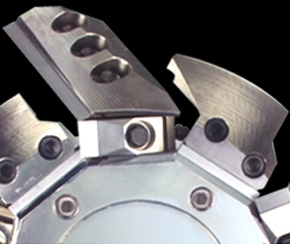 The helical surface of the limiter clamp and secondary limiter matches the cutting contour of the knife, providing stable surface contact with the log/cant if it begins to surge. 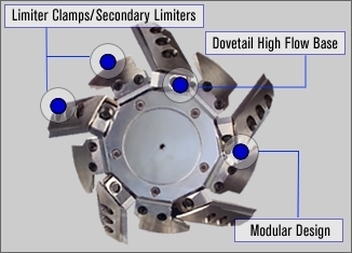 Limiter Technology ensures smooth and consistent log/cant flow, minimizing surging and reducing step cutting on entry. The innovative dovetail base design allows Key Knife to fit more knives in a cutting diameter than conventional bolt-on bases. The back of the base is smooth and open allowing chips to exit without hitting metal edges that break up quality chips into pins and fines. The base mounts to the hub using only a gib and gib bolt. 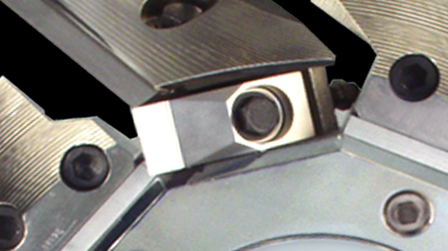 The simple design allows the user to either install or remove the base by removing one bolt, saving valuable time. Allows for easy removal of wear parts. Especially beneficial when metal contaminants enter the system. Unlike solid heads...the damaged parts can be changed out, saving both time and money. The counterknife is designed to fully contact the knife in the keyway and back side of the knife. 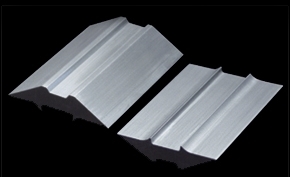 Full surface contact minimizes knife twist and flutter, significantly improving knife stability. Through exceptional knife stability the High Recovery Semi-Solid XL System delivers improved finish, chip quality, and knife life. 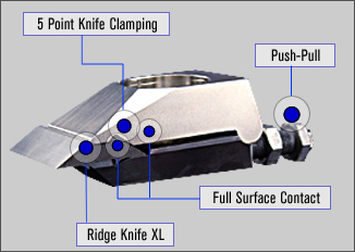 The innovative design of the Ridge XL Knife, Clamp, and Counterknife system produces 5 point knife clamping. 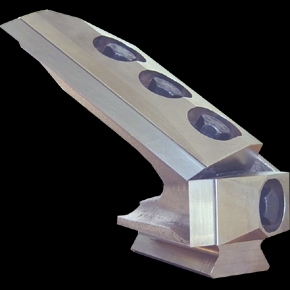 5 point knife clamping significantly improves knife stability, for a precise and repeatable cut. Push-pull technology allows precise adjustments to the facing knives to provide optimum surface finish. In turn, this improves the lumber finish for grade improvements. The knife is indexible and disposable, eliminating the need for grinding and babbitting. The innovative ridge design eliminates problematic packing, protects the counter knife from wear, and improves chip quality by providing chips a smooth transition from knife tip to counterknife. 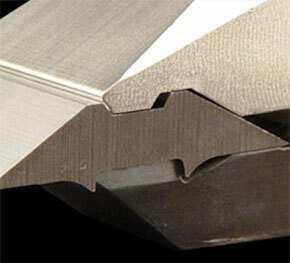 The pre-cutting saw provides a sawn finish with little to no knot pull out or fiber pull for a superior finish. Key Knife uses a ring saw configuration to keep weight down, as well as cost. The saw is universal for both right and left chipping heads. The post cutting saw follows the finishing knife to clean up the cut for a sawn finish. Because the entire width of the saw face is not used (approximately .015”) less sawdust is produced, and recovery is maximized. Key Knife uses a ring saw configuration to keep weight down, as well as cost. The saw is universal for both right and left chipping heads. Bolt-on base assemblies are available for Swecan and CME hubs.